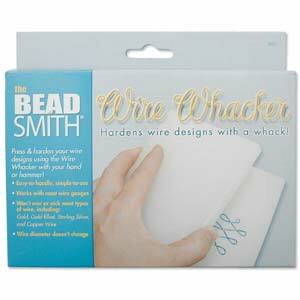 "Press & harden your wire designs using the Wire Whacker with your hand or hammer! Easy-to-handle, simple-to-use will work with most wire gauges and the wire diameter will not change. Won’t mark or nick most types of wire, including: Gold, Gold-Filled, Sterling Silver & Copper. After placing your wire designs between the 2 Wire Whacker boards, whack the top board with your hand or hammer. Your wire designs will harden and retain their shape!"